Ladies Golf on a Par? After reviewing Melvin Burgess’ new book ‘Kill All Enemies’, we were privileged to be given the chance to go to his house and interview him about it. In the run up to this, we were feeling slightly nervous about interviewing a 'famous writer'. However, as soon as we met Melvin, we were incredibly relieved to realize that he was friendly and down to earth. As we sat around his kitchen table, eating chocolate cake he kindly bought for us, the questions started rolling. Melvin said that his inspiration to start writing came from the fact that English was the only subject he felt he was good at in school, and that he was always daydreaming in class, making up stories in his head. He’s always enjoyed reading books and it was inevitable that at some point he would start writing his own. On the difficulties of getting his writing published early on in his career, he said that it was because no one would read his work. His technique was to write something, send it off, and then start on another book, forgetting about his previous attempts so as not to get disheartened. Melvin says “you need thick skin in this business” and that it helps to just “take it on the chin”, not personally. Trying to explain what his favorite genre to write within, Melvin said that he loves to write about real people in real life situations as “everyone has a story”. His stories therefore have a unique element to them which other, completely-fiction novels lack. Melvin here let slip that he’s currently finishing a horror novel, which he’s really enjoyed writing, and is something for us all to look forward to. Discussing the criticism he has had to face over the years of writing gritty and truthful novels, like Junk and Doing It, he told us that the criticism was not too hard to handle, and the fact that critics were writing about his work was in fact helping to publicize it. His book Junk has been discussed and debated at a national level, which only makes people more interested in reading it. “Any publicity is good publicity” as the old saying goes. As for the inspiration for him to write ‘Kill All Enemies’, he told us how he carried out many interviews with young people about their captivating life stories, saw a gap in the market and decided to try and show how problem teenagers can often be heroic, not just the A* students, and that we shouldn’t think of them as worthless. Melvin Burgess also told us how he wanted to “create a voice” for these children, when they are often not heard otherwise. Kathrine explained how she had read that Melvin visited various Pupil Referral Units (PRUs) in the North West and asked Melvin to elaborate. He believed this helped the book feel more real, and that he wanted to have the correct facts about what it was like in the PRUs instead of just using his imagination. He also told us how he met a band called ‘Kill All Enemies’ who, as you may have already guessed, gave him the name for his new book, as well as inspiring him to create several characters for the novel. Asked if he planned the structure of the story first, his response was that he always has a blue print and an idea. He works out the story roughly and some key points, but then he adds in all the detail. We were intrigued to work out whether he aimed, through books such as Junk, to educate a teenage audience about the risk of drug taking. Melvin made clear that he doesn’t initially write his novels to educate young people, but that as there are so few books out there that actually home in on the truth about drug taking, Junk in particular, has been used in many schools. He thinks it’s great that his work has educated people, explaining that the first person you write a book for is yourself, and “if you can educate yourself whilst writing it, you’ll probably educate someone else”. His top tip for aspiring writers was to “just keep trying” and have a “thick skin”. Melvin was incredibly easy to talk to, and it was fun and interesting to interview him about his new book. He encouraged us to carry on with the work we were doing, and seemed really enthusiastic to receive feedback on the novel. 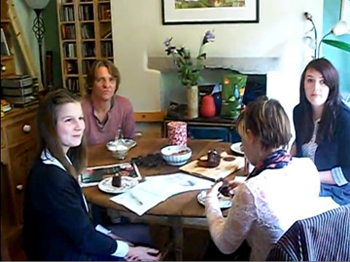 Overall, the experience was surreal (eating chocolate cake at Melvin Burgess’ house) yet entirely enjoyable. First part of video footage of the first part of interview with Melvin Burgess followed by remainer of interview. Note: Read their review of Kill All Enemies published prior to this review by clicking on this Kill All Enemies link. Details of an In conversation discussion with Melvin Burgess at Blackwell University Bookshop on Tuesday 06 September are available by clicking on this Kill All Enemies link.